The withdrawal of government funding threatens South Korea's innovative RTV, writes ELLIE RENNIE PRESS and broadcasting institutions the world over are struggling to survive in the turbulent climate we call “media convergence.” So what’s the big deal about one new name on the endangered media list? Unfortunately, the television channel under threat this time is South Korea’s RTV and it is a rare species as far as broadcasters go. The station provides access, funding and training to producers from all walks of life and strives to assist underrepresented communities. Until now, RTV and its programmers survived off money from satellite provider SkyLife and the Korean Communications Commission (KCC). The money from KCC will dry-up in a month’s time, leaving only the SkyLife funding (around 400 million Won), which is barely enough to cover transmission costs. Korean media activists, who fought long and hard to establish and maintain the channel, are now desperately looking for a means to keep RTV alive. 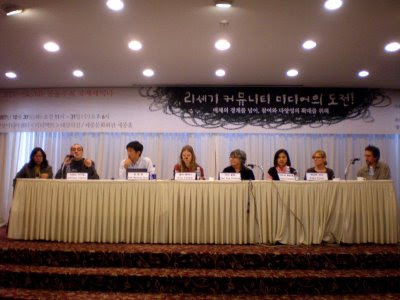 I first visited Seoul in autumn of 2007 to participate in RTV’s fifth birthday celebrations. Ellie Rennie and others at the 2007 celebration of RTV. 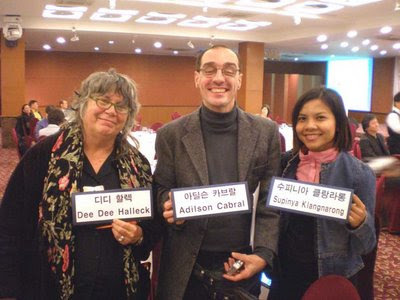 I was invited to speak about community media in my country, along with six other international alternative media pioneers and researchers (DeeDee Halleck, Supinya Klangnarong, Jon Stout, Katherin Araujo, Adilson Cabral, Kate Coyer and Gabi Hadl). 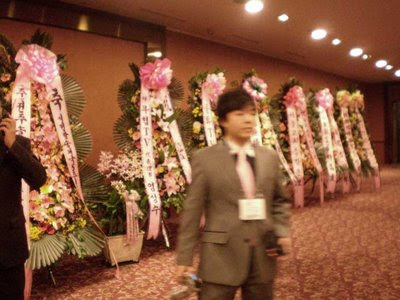 At the massive banquet dinner we stood in front of towering wreathes of flowers and ribbons – gifts from various government departments and corporations. We listened to enthusiastic speeches as DeeDee went up on stage to cut a large jelly-like rice cake. It looked to us as though RTV had a bright future and wide support. Public access television (also known as community television) is not an easy project to undertake. I have visited stations around the globe and seen only the occasional success amongst countless variations (there are over 2000 access channels in the United States alone). Before YouTube, public access television was the only systematic means for non-professionals to screen DIY videos. Today, the more successful access stations do more than YouTube, performing a curatorial role whilst still adhering to community governance principles. When the formula is right, a community television channel can be kaleidoscope of local culture, an industry training ground and an important tool for social movements. The Koreans were late starters in the community TV game.